Could You Wear No New Clothes? I’ve written several times here on the importance of thrift store shopping and buying used whenever possible. But I just stumbled onto this amazing Brooklyn designer who is living this philosophy to the fullest. Her name is Jesse Arrington, and she writes the funky, colorful blog, Lucky So and So. She also was just featured at TED, which is huge, huge huge for her. Here’s what she did. She was invited to talk at TED, spending a week in the conference. All she packed, get this now, all she packed was a week’s worth of underwear. All the outfits she wore to this huge, important event were purchased once she got to Palm Springs, CA, at local thrift stores. She picked out her thrift store outfits, bought them, wore them, and then donated them back, bringing home only her underwear. I mean…really? Look at that dress! With those shoes! I am in love with Jesse’s awesomeness. And her haircut. And her amazing sense of style. 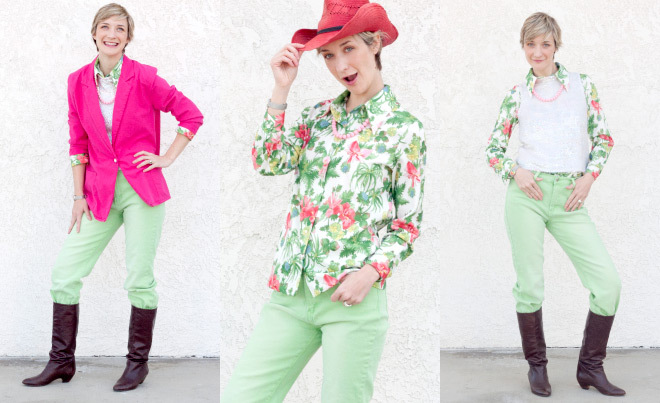 If you want some ideas and inspiration for buying used clothes and putting together amazingly stylish outfits out of your thrift store finds, I’d highly recommend checking out Jesse’s blog, Lucky So and So. It’s fun and incredibly inspiring.